Dette er en genudgivelse af artiklen: Marzena Królikowska-Dziubecka: ‘A Portrait of Copernicus from the Print Room of the Warsaw University Library’, in: Meddelelser fra Thorvaldsens Museum’ 1997, p. 173-175. The arrival of the magnificent sculptor Bertel Thorvaldsen in Warsaw in September 1820 was a great artistic and social event. Two days after his arrival in the capital of the Kingdom of Poland a dinner was given in his honour by the Department of Fine Arts and a group of professors at the university. During the visit Stanislas Staszic, then president of the Association of the Friends of Science, presented to Thorvaldsen the idea of the monument to the great astronomer Nicolaus Copernicus. The contract for the realization of the monument was signed on September 30th 1820. It is obvious that the artist had to have an iconographic source at his disposal to execute such a portrait sculpture. A swift execution of the monument (the first version was ready by May 1821, indicates that a picture showing a potrait of Copernicus must have been taken by the artist from Warsaw to Rome. Fig. 106. Unknown: Portrait of Nicolaus Copernicus. After Theodor de Bry and Jean Jacques Boissard: lcones Virorum Illustrium. 1597-99. At the exhibition “Thorvaldsen in Poland” an engraving by an unknown artist based on the portrait in Theodor de Bry and Jean Jacques Boissards book lcones virorum illustrium was exhibited. The print was in the possession of Thorvaldsen and was kept in his studio in Rome (fig. 106). The characteristic frame of that etching-cut out and placed within a double framing: A green watercolour frame and an engraved one – indicates its origin from the collection of the last Polish king – Stanislas August Poniatowski. 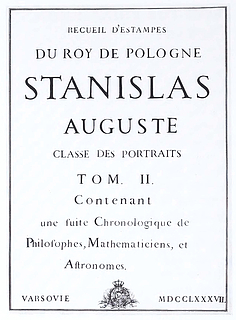 The graphic collection of the king was purchased from his inheritors for Warsaw University in 1818 thanks to the initiative and support of the minister Staislas Kostka Potocki, then president of the Government Commission for Religion an Public Enlightenment, and its member Stanislas Staszic. They were both engaged in the project of the Copernicus monument. The king’s collection consisted of three basic departments: prints, drawings and books with prints, both by Polish and European artists. The oldest and largest part consisted of prints. They were arranged by subject in 163 large wooden portfolios which looked like books. The portfolios were bound in calf-leather and decorated with golden ornament and Royal superexlibris. Each print was cut out and fixed to white Bristol board sheets, a number of them on each sheet. The prints were circled with green paint and the specially engraved frames. The backs of the sheets were covered by a special tissue, which protected the prints against wear and tear. There were handwritten title sheets in each portfolio. 67 of these portfolios remain, and they are preserved in the Print Room of Warsaw University Library. Portfolio no. 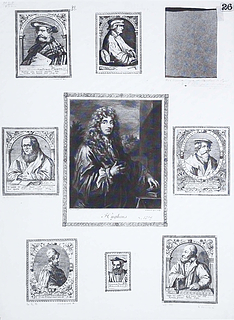 39 of this collection, containing portraits of philosophers, mathematicians and astronomers has also survived (fig. 107). Fig. 107. Titlepage of Portfolio no. 39 in the collection of Stanislas August Poniatowski. On sheet no. 26 there is a gap in the upper right corner after the cutting out of an engraving whose dimensions are 156×115 mm (fig. 108). At the bottom there is a handwritten note by the keeper of the collection at that time, the painter and engraver, Jan Piwarski: “Portret Kopernika wyieta dla Thorwaldsena do Rzymu”. Lower down there is another handwritten note, by the conservator from the St. Petersburg Academy of Fine Arts, Nikolaj Utkin: “N. Estampe à été decoupé/N. Outkine”. The portrait of Copernicus in the possession of Thorvaldsens Museum in Copenhagen is 154×114 mm and perfectly fits the gap in the above mentioned sheet no. 26 of the collection of the king Stanislas August Poniatowski. That print was not numbered within the portfolio and was not listed by J.F. Piwarski in 1832. This list was prepared as a result of the confiscation of the whole Print Room collection by the Russian authorities after the defeat of the Polish uprising of 1830- 31. The sealed collection was sent to the Academy of Fine Arts of St. Petersburg. The list made by J.F. Piwarski served as a base for the catalogue prepared by N. Utkin in 1843-1849. This catalogue does not mention the missing print. It seems logical that Bertel Thorvaldsen received the engraving during his visit in Warsaw in 1820. The way the royal collection was arranged made it easy to find the source required by the sculptor. At the time Thorvaldsen was visiting Warsaw, the Print Room was formally a department of the Public Library, and its main task was to serve as a national library. The collection of the Print Room was not only used by scholars and students of the Fine Arts Department of the University, but also the pride of the Polish nation. Presenting its collection to such a famous artist as Thorvaldsen must have been obvious. Fig. 108. Page 26 from Portfolio no. 39 (see fig. 107) with the empty space where the portrait of Copernicus was cut out.